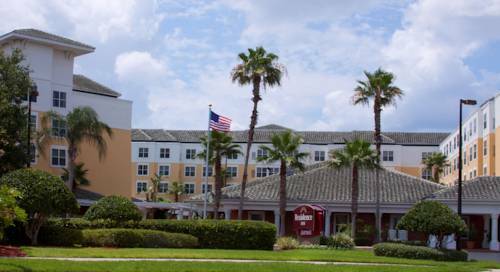 The Residence Inn Orlando Lake Buena Vista seamlessly blends the essence of The City Beautiful with the excitement of the Theme Park Capital of the World. Unlike other Lake Buena Vista hotels, ours is an official Walt Disney World Good Neighbor Hotel offering easy access to Walt Disney World , ESPN Wide World of Sports , Epcot , the Magic Kingdom Park, Disneys Hollywood Studios , Disney Springs Area and Disney's Animal Kingdom Theme Park. SeaWorld , Universal Studios Florida , Orlando Premium Outlets and the Orange County Convention Center also are near our downtown Orlando suites. Start your day with a complimentary breakfast before heading off on an adventure. Travelers can relax in well-appointed suites boasting full kitchens, luxurious bedding and complimentary high-speed wireless Internet. Take a refreshing dip in our outdoor resort-style pool, or maintain your exercise routine in our modern fitness center. The fun never ends at our hotel in Lake Buena Vista, Florida.